Is your dog so hyper and out of control that you put him out when visitors come or have you even resorted to keeping him outside all the time? When you do let him in, is he is so wild that you just put him out again? Chances are that instead of a serious behavioural problem, you have an under-exercised dog! A tired dog is definitely a better behaved dog! All dogs need daily exercise of some kind but the amount and type they need is influenced by their breed and age. Even if your dog has a big garden to run around in, it is essential for his physical and mental health, that he have exercise off the property every day. If your dog is really out of shape or overweight, it is best to get your vet’s OK before starting a serious exercise plan. Young puppies should never be over exercised as they are very prone to joint injury. They should have 2 or 3 short sessions of exercise every day. Your senior citizen should still be taken for regular walks and get a chance to chase his ball if that is what he enjoys. Adjust the amount of exercise your dog gets as he ages. For many elderly dogs the highlight of the day is his daily walk. Change the focus of the walk by slowing down and allowing your dog to stop and sniff more often. Flat faced breeds (e.g. Boxers, Boston Terriers, Bull Dogs, Pugs, Pekingese and French Bulldogs) should be exercised with caution as they can quickly overheat. Giant and heavier breeds (e.g. Bernese Mountain Dogs, Giant Schnauzers, Great Danes, Boerboels, Bull Mastiffs and St Bernards) should be exercised with caution especially on hard surfaces and while still growing. Toy breeds (e.g. Min Pins, Italian Greyhounds, Yorkies) should be exercised for shorter periods and over shorter distances than larger breeds. Short legged breeds (dachshunds, Bassets) should also be exercised for shorter periods. Be very cautious on hot days as your dog can overheat very easily. Young puppies and flat faced breeds should not be exercised in the heat of the day at all. Most dogs will happily go out in the rain so bad weather should not be used an excuse to miss a walk! 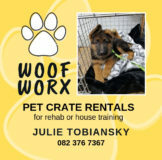 Get yourself some comfy all weather clothing and keep an old towel near the door to dry your dog off when you get home. Most vets will warn you not to exercise your dog after a meal as there is a risk of bloat (gasses building up in the stomach) which can lead to torsion (stomach twists) which is often fatal. I have had two dogs suffer from torsion and neither had been exercised after a meal. Nevertheless I would go with the health care professional’s advice and rather feed your dog after exercise. Dog’s love routine and quickly pick up the cues from us that we are about to take them out. Take your dog for a walk when you get up in the morning and then again in the early evening before supper. Make your dog sit quietly to have the lead and head collar attached and only walk out of the door when he is under control. Lead walking – this need not be walking at heel but you should not allow your dog to pull on the lead (Use a head collar to control pulling). Walk briskly and don’t allow your dog to drag you from tree to tree or lamp post to lamp post. Instead, stop occasionally to allow your dog to sniff and relieve himself. (carry poo bags to clean up). Don’t allow your dog to harass dogs behind fences or gates. Fence fighting can become an obsession. Carry yummy treats or a favourite toy to reward loose lead walking. Free Play – take your dog down to the local field or park when owners and dogs congregate. You will need some basic control to ensure your dog’s safety i.e a reliable recall and a reprimand to interrupt rough play or unacceptable behaviour. Keep an eye on your dog at all times when he is running off lead. Puppies should not be allowed to play off lead until they are 6 months of age. Running– Some breeds are more suited than others to running or jogging. If you are looking for a running companion breeds to consider are German Shepherds, Border Collies, Dalmations, Pointers, Weimeraners, Ridgebacks, Siberian Huskies, Golden Retrievers or Dobermanns. Heavy, short legged or flat faced breeds do not make the ideal running partner although there might be some individual exceptions. Never start running with your dog even for short distances until he is a year old. Get your vet to give the go ahead. (I always have my GSD’s hips X rayed before starting.) Start very gradually, building your dog’s fitness and stamina. Run early in the morning or late in the evening. Always keep your dog on the lead as even the best trained dog can be tempted to chase squirrels or cats (I always use a head collar at first).Once your dog is fit, he will be able to safely manage long distances. (my GSD’s handle 15k-20km very easily). Stop often for water. Most service stations have a tap that they are happy to let you use. Teach your dog to run on the pavement and not to veer from side to side as you can be tripped up. Swimming– Some breeds love the water (Labs and Golden Retrievers especially) and once they have learned to swim are difficult to keep out of the water. Swimming is good exercise for your dog as it is not weight bearing which makes it a safe option for dogs with joint problems. Retrieving– fetching a ball or Kong is great fun for your dog. Always use a toy on a rope as it can never be swallowed, is easier to throw and more difficult to lose. Be careful of throwing anything for a puppy under 6 months as twisting, jumping and landing can damage his growing joints. Agility- most dogs love to jump. You can join a dog club that offers agility training or make your own jumps in the garden. Keep the jumps low at first and never force your dog to jump. Your dog needs to be over a year old before you start jumping. Hiking– there is nothing better than hiking with a canine companion. Hiking is not suitable for puppies. Keep your dog on the lead as he can bother other hikers and can harass wildlife. (dogs easily can get lost in the forest or mountain in this way). Always carry water with you for your dog and be cautious of other dogs out hiking as they may not be friendly. Fill a plastic cooldrink bottle with dog pellets and allow him to work out how to get the pellets out by nosing, rolling and pawing it. Throw your dog’s meal into the back of the flower bed or around the garden. This will allow him to use his foraging instinct to find his meal. Meals do not have to be served in bowls. Play hide and seek games with a favourite toy, treat or family member. Allow your dog to hunt until he finds the reward. Stuff a Kong or hoof with soft food and allow your dog to work at it to remove the filling. You can freeze the filled toy or hoof to make it last a little longer. Teach your dogs some tricks or obedience exercises to earn rewards. e.g. sit at the door to get it to open, lie quietly on the floor to get a tummy tickle. How do you know if your adult dog is getting enough exercise and stimulation? If at the end of the day when you settle down to watch TV or read a book, your dog curls up at your feet to have a snooze or lies quietly chewing a bone, your dog is getting what he needs. If your dog is dashing around madly, barking or harassing you, you need to work a little harder to make sure your dog gets more of what he needs. My son just brought a 7 week old pink nose pitbull home. I need to know how to toilet train him as he cries when we leave him outside. We also leave him at home alone most of the time as we at work and school. 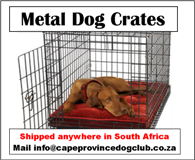 Drop me a line info@capeprovincedogclub.co.za – so I can put you in the right direction with more info. Are you exercising your dog early in the morning or late in the evening? If not, it might just be the heat which is affecting your dog. How old is he/she and how far are you walking? Let me know the answers to these questions and I will try my best to help you. You need to ignore him when you leave and ignore him when you come home. Teach him that being away from you is a positive experience. You can do this by giving him a food-stuffed Kong toy or a large raw meaty bone only when you leave. When you get home, you remove whatever is left. coping without being right on top op you. Sometimes ignore him completely, even though he is right there and act a little off hand. You can still give plenty of love but just not all the time. I adopted Brucelee – male 3 or 4 year old colliexafrikanus – awe walk 2 hours a day 4-6 Km’s per day and either to DeWaal park ( dog park) or Company Gardens where he swims, hunts & socializes – he is mindblowingly smart .. He is super well behaved & I give him raw medium sized bones twice a day to chew on. He plays with a ball ( fetches ) only indoors – but never outdoors ( too much outdoors ( in parks) to smell ..
Have you tried some training? Dogs thrive on the stimulation of learning new things so a few short sessions a day of learning to sit, down, stand, go to bed etc will keep him on his toes. You can also teach him some tricks. Another alternative is to train him with a flirt pole – a “fishing rod” with a soft toy on the end which he gets to chase and pounce on. Part of the game is to teach him to wait for the command to “get it”. You can make your own with a piece of PVC pipe and a length of washing line. Google “flirt pole” to see them in action. Brucelee sounds like a very luck, well adjusted dog. Your pup can manage a 10 to 15 minute walk so round the block would be plenty. You can also take her on lots of outings in the car with stops to meet new people and see and smell new things. Your Saint can manage two short lead walks a day maximum half an hour each. Your dog needs 2 walks a day of about 20 minutes to half an hour each. A calm environment makes for a calm dog. Quietly ignore your dog on greeting and whenever he is excited. Make sure that the best attention (and treats) are given when he is calmest.